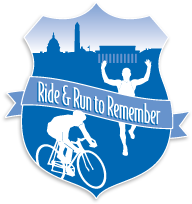 I’m just getting back into the swing of “normal” life after spending the weekend in the DC area participating in the Ride & Run to Remember event which benefits the National Law Enforcement Officer Memorial Fund. I did this ride last year as well so this was my second time back supporting this great organization. The weekend started with a longer than usual drive down thanks to an inordinate amount of traffic accidents with a mix of rain on and off. Thankfully my bike wasn’t on the back of my SUV as I had made DIY fork mount which allows it ride inside safe from the weather and thieves. We didn’t arrive to almost 11:30pm at night and needed to be up and in the city at about 7am for walk/run registration. Surprisingly neither of us could really sleep so we were up and out early headed to Dunkin’ Donuts for a coffee before the event. We ended up having to go to two DD’s due to the workers in the first one not being able to tell time but we still arrived with plenty of time before the race start. Little did we know it was going to be delayed for more than an hour! We were not prepared to be outside standing around in the cool windy temps for that long and really got chilled. There were other events going on in DC that day so MPD and the organizers had to modify the route which took some time. We ended up bailing after waiting an hour as we were both shivering. Had they started the event on time we would have been fine. My fiancée ended up completing the 5k virtually on the treadmill at the hotel and I had no issue doing the 2k walk with all the walking around we did. I’m not sure when they actually started the walk/run but it was well after we left, kudos to everyone who stayed and braved the wind and cold. Anyway, for me the event I look most forward to is the Sunday bike ride. It is billed as a 55 mile ride but last year it totaled 59 and this year they modified it slightly so it was around 57. My only goal for the day was to better my time from last year which I did by almost 20 minutes. It might have been even more but there is about 2 miles of bike trail you ride on near the finish and it had washed out and heaved sections which really slowed down your average speed. Overall elevation was 2200′ according to my Garmin, so it’s moderately hilly @ a little less than 40′ per mile. But like I said last year, being from the north east I’ve had shorter rides with more elevation so it wasn’t anything I wasn’t used to. I started out towards the front and was probably in the first dozen or so going through the gates. There was no wind to speak of but the on bike temp was under 40 degrees F so it wasn’t long before I was wishing I had worn my long fingered gloves. Arm warmers, knee warmers and some embro on my calves were fine for the rest of my body but my fingers suffered for about the first hour until I could get out into the sunlight. After that it was smooth sailing. I hooked up with a couple of different groups of riders between stops 2 and 4. We had a strong paceline going for a good bit until some climbs broke us up before the last rest stop. I needed a bottle refill after that and ended up riding the last short leg (~8 miles) solo. I look forward going again next year and riding with some awesome people again.